A personalized WordPress website can serve as an extension of one’s self. This can be a huge merit for artists, modeling agents and musicians. Best Free WordPress Themes For Artists! Share it Now! 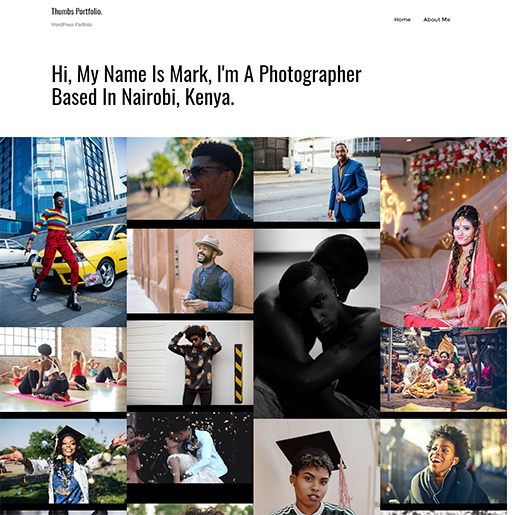 #wordpress #freewordpressthemes #wordpressportfoliothemes #wordpressthemes #wordpressthemesforartists Click To Tweet By making use of WordPress themes for artists, you can create impress portfolios for photographs, awe-inspiring galleries of your artwork, art and video blogs and much more. Moreover, using personalized WordPress themes for artists provides you with the necessary tools for showcasing as well as marketing your products and promoting yourself on the internet. However, there are also various elements you should keep an eye out for your WordPress artist themes. These include easy portfolio/project listings, blog-friendly features, customization and layout management. Moreover, the features built for artist themes aren’t just limited to these. Music artists might need features for audio embeds and media players. Freelancers will require ways to list their services in an attractive manner. Therefore, there can be tons of elements that might be needed for your WordPress artist themes. In conclusion th,ere are tons of options to choose from, for any niche WordPress theme market. Thus, in order to lessen your burden, we have handpicked a perfect list of free WordPress of themes. Whether you’re a digital artist, a 3d designer, a painter or an animation artist, we’ve got all the right picks for you! So take a look at our list of best WordPress themes for artists that we’ve judged based on different aspects. This includes flexibility, design choices and showcasing capabilities. If you have any recommendations or further additions to this list, feel free to comment about them. Moreover, if you enjoy our list, do leave a word or two about your thoughts and suggestions. 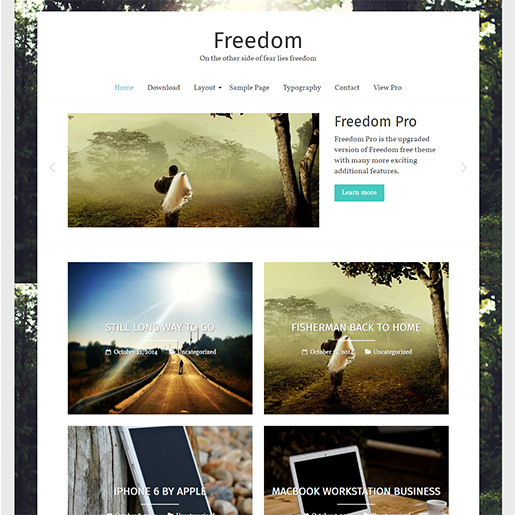 Freedom is a highly flexible and responsive artist and photo blogging theme. 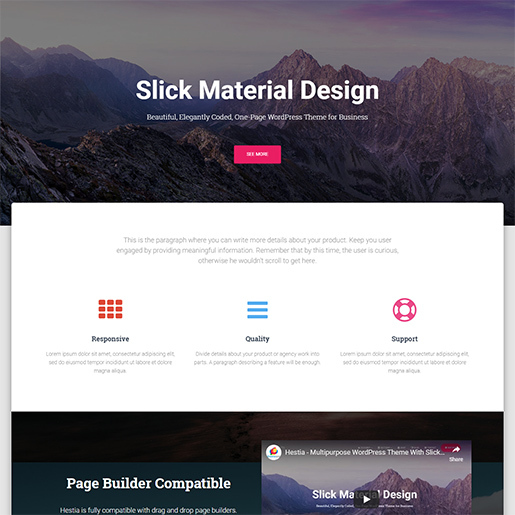 This ThemeGrill in-house theme comes with strong gallery and typography features. Moreover, Its Photo blogging view can work as an impressive blog section powered by your own imagery and creativity. This, alongside the amazing slider, works to instantly attract your viewers’ attention to your content. Use the combination of various layout options, typography features, custom contact forms, awesome sliders and various color options to let your website to flourish your taste in art and designs. Furthermore, the theme is not only designed to be cross-browser friendly but is also highly SEO optimized. Layout options for individual pages/posts. 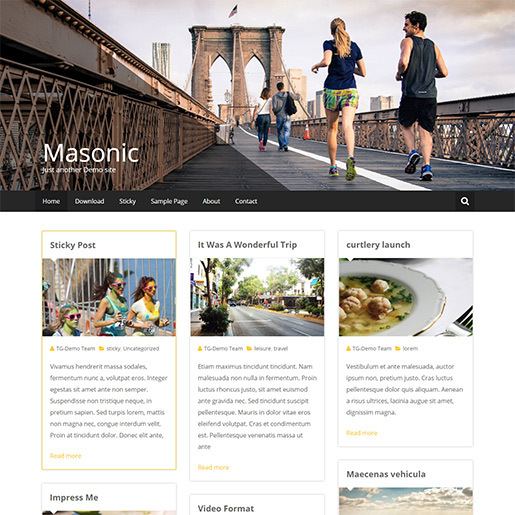 Masonic is a responsive free WordPress theme for artists that features a masonry style page design. This essentially gives your website a Pinterest-like gallery which is perfect for portfolios and art blogging. Therefore, artists can Masonic to create impressive art galleries and mindblowing portfolios. Couple this with amazing blogs and you have a perfect combo to wow all your viewers. The theme is built to be fast, optimized and responsive so that browsing your website is as easy as praising your art content. Besides this, the free WordPress theme also comes with added benefits of customizations. Customize your colour scheme, background images/colours, menus, widget areas and much more using Masonry. SEO friendly and completely responsive design. 4 widget areas and Translation ready. Another one of our in-house products, Radiate provides you with a clean, retina ready design perfect for artistic blogging. The responsive WordPress theme supports parallax header images and custom backgrounds. What makes radiate great free WordPress theme for artists is its gallery option. Moreover, integrating Radiate with the Jetpack plugin enables amazing Tiled as well as Slideshow galleries for various artistic purposes. The gallery can serve as a portfolio by providing your images with the perfect placeholder. Additionally, for your convenience Radiate also comes with a custom contact form to help interested personnel and companies connect to you directly. 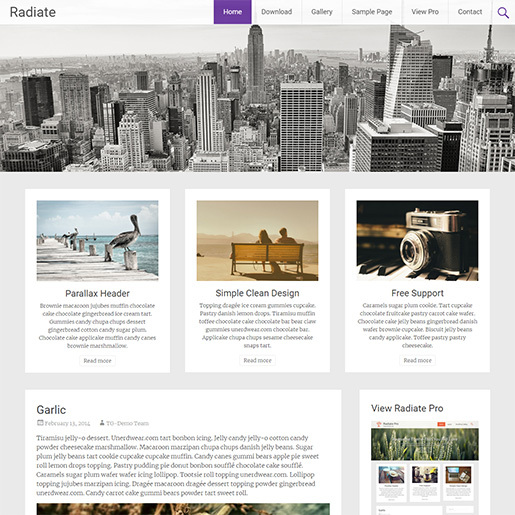 If you’re looking for free WordPress themes enabled with parallax effects, then Radiate is the perfect fit for you. So, go ahead and try out this amazing theme now and tell us how you feel about it! Features a Parallax header image. Primary colour option built with a Sticky header menu. Translation ready and Cross browser compatible. 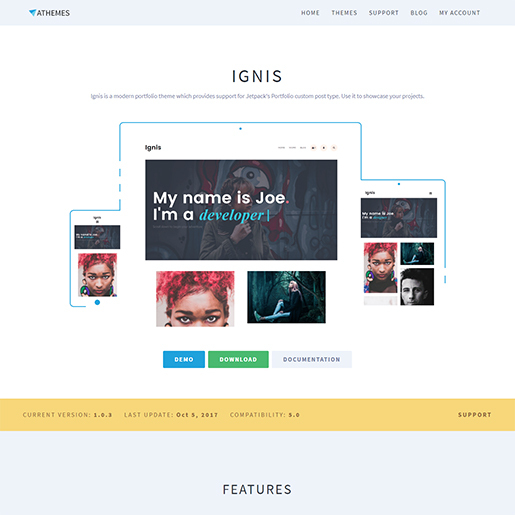 Ignis is a dedicated portfolio WordPress theme for artists. With Jetpack’s portfolio custom post type, Ignis lets you create the breathtaking portfolio and gallery designs. For further website attraction, make use of Ignis’ Header section that supports static images as well as videos. You can edit the entire website theme to your heart’s content with tons of theme options using Ignis. Similarly, the responsive theme also has blog friendly features. For blogs, Ignis provides you with 3 different blog layouts and a wide selection of Google fonts. As a final touch, Ignis is also completely translation friendly and works perfectly on all browsers such as Chrome, Firefox, Opera, etc. Customizable Header media with video support. 3 blog layouts and various google fonts. Tons of easy to use theme options. York-lite is a great choice amongst the various free WordPress themes for artists available currently. The grid-based portfolio design is a great choice if you’re an artist, photographer, curator or freelancing visual artists looking to expand your career. York lite lets you create an extension of yourself using its mobile responsive grid design, retina image support as well as its modern look. Additionally, the SEO optimized theme provides you tons of customization options to suit your website perfectly and make it as visually stunning as your art, even on the first glance. 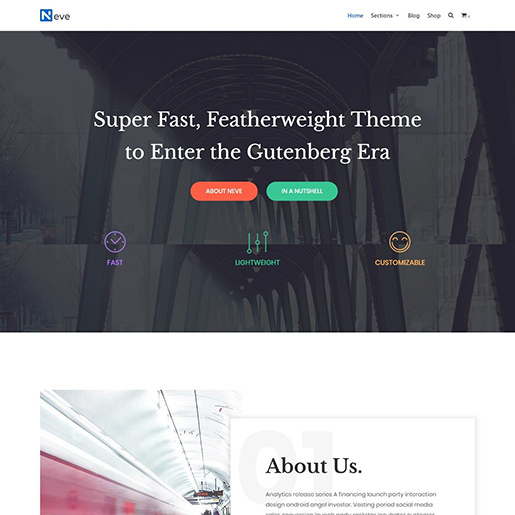 Finally, York lite is a free WordPress theme that is made with WordPress 5.0 and Gutenburg in mind. It’s block based, modular design makes arranging and managing content extremely easy. Modern design with Gutenberg ready features. Lightweight and easy to customize. 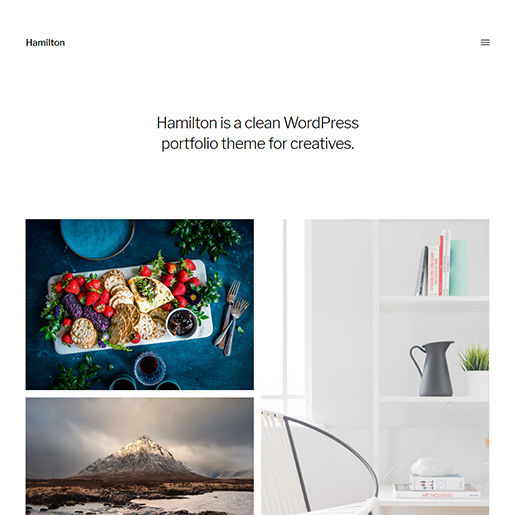 If you’re a creative visual artist looking for a free WordPress theme to help you promote your creations, then Hamilton is the perfect theme for you. It’s a beautiful, sleek design is sure to complement your artistic creations to an impressive degree. Choose from a wide range of typography options and layout choices to put your artistic designs in the center of attraction. Likewise, Hamilton lets you create amazing galleries with its portfolio friendly style, stacked gallery designs and complex grids. Moreover, the feature-rich Free WordPress theme for artists is also completely retina ready and is built to be responsive and fast on all digital platforms. Portfolio friendly design that comes with stacked gallery grids and Infinite scrolling. Tons of Typography and Layout options. Supports Translations, RTL languages, and Gutenberg editor. 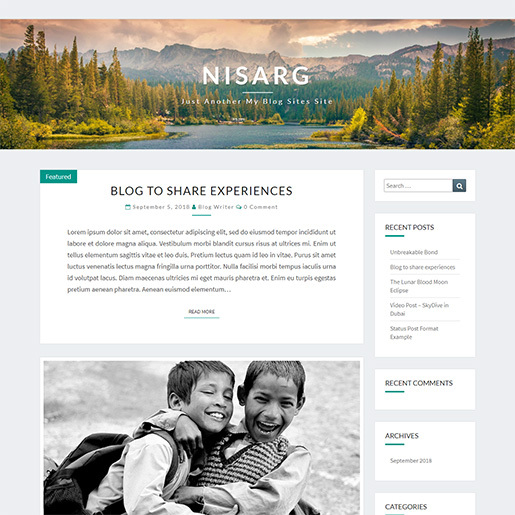 Nisarg is one of the most comfortable to use free WordPress themes for artists. Nigasrg lets you make changes in tons of website theme options to suit your own visual style. Feel free to personalize the header designs, backgrounds, color options and accent colors to your heart’s content using Nisarg. As Nisarg is inherently a theme made for artists, travel enthusiasts, and photographers, the theme completely supports image blogs. You can allow your posts to show a glimpse of its juicy essence using the post excerpt option. Likewise, The theme also features over 5 different widget areas, Translation and RTL language support and more. It’s responsive and user-friendly design is just the perfect cherry on top. Easy to manage Theme options. Customizable header image, background, and accent colors. Responsive and SEO optimized design. Translation friendly with RTL languages support. Musicians are artists too, and Rock-Star a WordPress theme for artist agrees quite well. This amazing WordPress theme for aspiring indie artists, bands and even music producers. You can use Rock-star and its theme options panel to customize tons of elements on your website. This includes layouts, colors, fonts, logos, favicons gravatars, fullscreen backgrounds and more. Likewise, Rock-star also comes with nifty widgets designed for Music based websites. 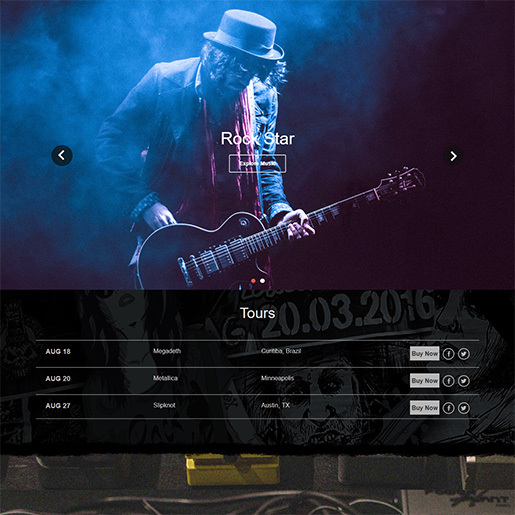 Any music artist is free to use Rock-star to create absolutely stunning home page designs complete with featured image, tour schedules, audio samples, video embeds, blog sections and more. This HTML5 WordPress theme also provides you with Social media integration. This comes in the form of custom social links, Instagram embeds and Social bio and more. HTMl5 and CSS design that supports mobile browsing. Fullscreen Background image and parallax effects. Sanremo is more of a minimalist addition to our list of best WordPress themes for artists. This modern theme is a great choice for any artisan, freelancer or visual designer and it provides you with the right tools to help your career grow. It’s Bootstrap framework powered design makes it highly responsive and works perfectly on both mobile and PC web browsers. Moreover, the addition of its Social widget provides you with customizable social icons to connect with social media. This along with its blog friendly design ensures maximum attraction to your content and your artistic creations. Additionally, the Elegant slider is designed to be easy to manage and customize. Sanremo’s easy customization features and menu customization ensures that browsing your website is also a breeze of a task. Free Social widget icons plugin. Easy to customize and manage. Responsive navigation with collapsing menus. 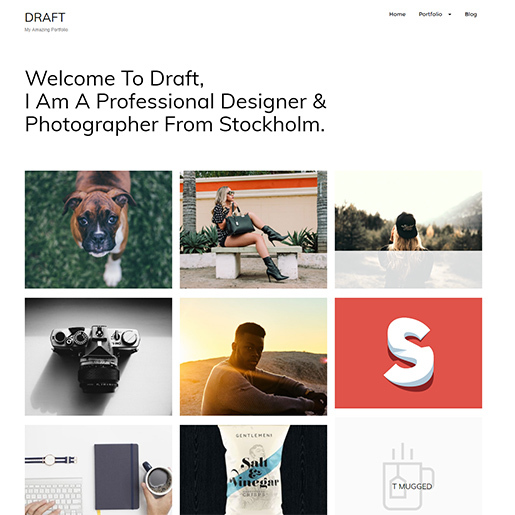 Draft is a fully functioning WordPress theme for artists designed to build impressive Portfolios and image galleries. You can easily et up impressive image galleries by easily uploading your artists and fit them in your website with minimal effort. Moreover, Draft is also fully personalization friendly with tons of simple customization options, tons of Google fonts and unlimited color options. Furthermore, Draft is not only fully responsive on all PC web browsers but also Mobile platforms along with its Retina-ready features. Moreover, you can use draft’s blog friendly feature and design to its full strength as much as you want. Portfolio and Gallery friendly design. Intuitive personalization features built to be user friendly. Mobile friendly and Retina Ready support. 600+ Google fonts and Unlimited color selection. Hestia is a WordPress theme praised for its material design. It’s multipurpose, responsive design makes it one of the most popular themes for startups. This obviously includes art and freelancing visual artist startups as well. Hestia is completely friendly with custom backgrounds with support for video backgrounds and sliders. In addition, the free WordPress theme is designed for maximum SEO optimization and browsing speed. Its Demo content allows you to set up a fully functioning website in minutes. This means that you can start working on your portfolio and career presentation instantly. Save both time and effort using this amazing free WordPress theme. Mega menus for easy website browsing. Custom backgrounds with Video and Slider support. Dedicated fast support and 1 Click updates. Demo content available with Video Tutorials. 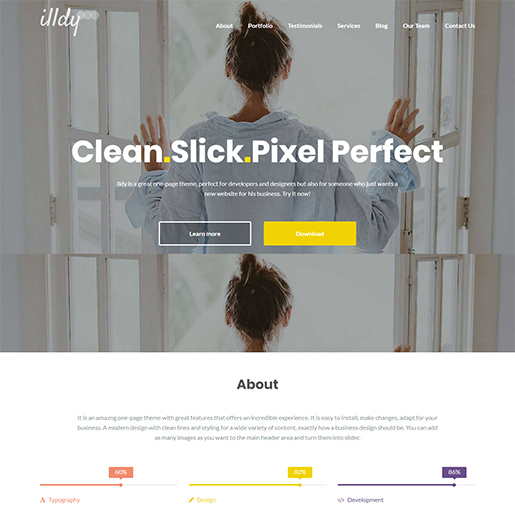 Illdy stands tall as a great multipurpose theme with a great emphasis on empowering artists and graphical designs. Create impressive portfolios, landing pages and galleries using this easy to use theme. Its one-page layout is highly suitable for entrepreneurs as well as freelancers. The Fullscreen hero image feature enables you to place your important content right in the spotlight. Furthermore, Illdy is completely compatible with all popular WordPress plugins such as Yoast SEO, Jetpack and more. Its addition of Font awesome icons, unlimited color options, and Retina ready design makes it a great first choice for any visual artist. The added benefit of WooCommerce supports any e-commerce purpose for your website as well. Hero image feature and Home page management features. Landing page, One page, and Portfolio friendly. Supports all major 3rd party plugins. Unlimited color options, Font awesome icons. Muso is another great pick for music artists. Besides the core features designed for music artists such as cool home page design, fullscreen background image, and nifty widgets; Muso also functions quite well as portfolio and blog theme. Likewise, the gallery section also comes with a fullscreen image/video viewer. This means you can easily embed both music/concert videos on your portfolio. Muso also provides you with SoundCloud and MixCloud integration which allows you to directly link your music and profile pages to all website viewers. 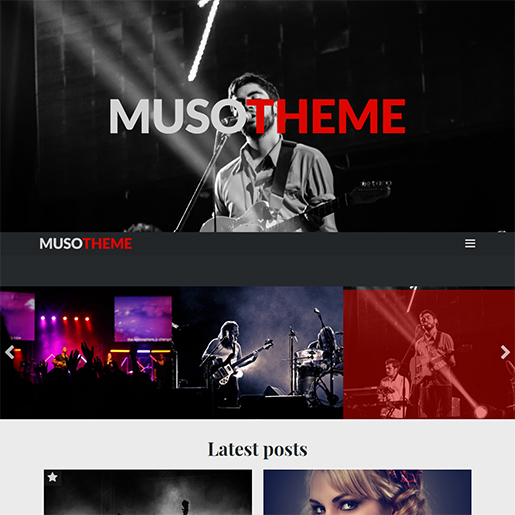 Similarly, Muso also comes with tons of different blog layouts to suit different types of blogging. Change your Page template to suit your website perfectly and use the tons of typography options and tools provided to you. As far as cool multipurpose artist themes go, Muso is a great choice overall. Customizable layout and sidebar options. Cool Gallery page with Video/Image Viewer. ScrollMe serves its purpose as a very cool Portfolio and gallery theme with a unique design. This free WordPress theme is a horizontal only scrolling website. This essentially presents a viewer with an interesting way of navigating through your website. 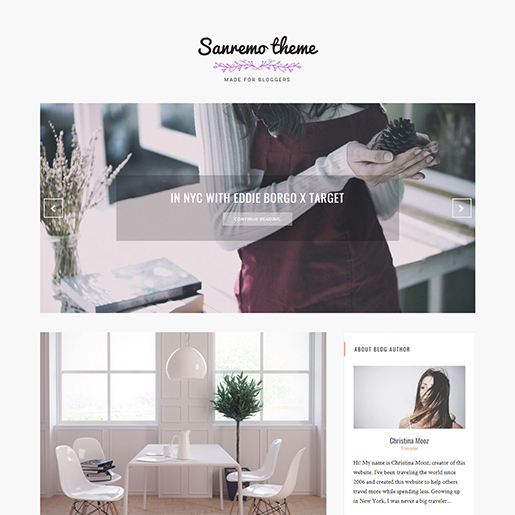 Everything about this theme screams artistic brilliance to us: whether it be the page scrolling buttons, the bottom drop-up menu, well-designed sections, and blog pages. Additionally, ScrollMe provides you with a very cool Masonry styled portfolio section. You can accompany your impressive galleries with Services sections, Progress bars, Pricing tables, Google map enabled Contact sections and more. Moreover, ScrollMe is also completely mobile friendly so you don’t have to worry about your mobile users feeling lost. Not to mention, the flexibility and compatibility of this theme are off the charts! Another visually stunning free WordPress theme for artists is Thumbs Portfolio. 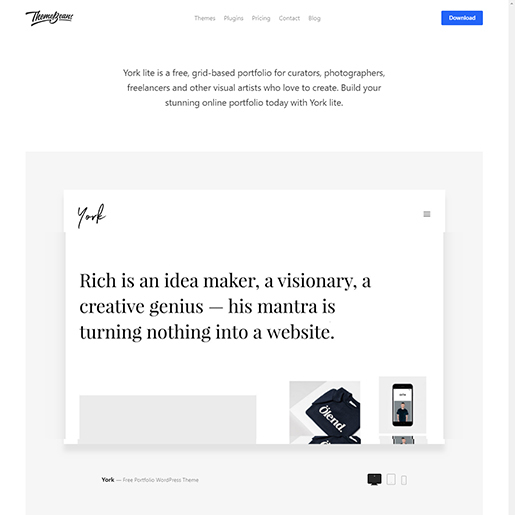 Thumbs portfolio is perfect to showcase your designs, products and creative work online: this theme comes with features that will leave anyone amazed. The interface is responsive and retina-ready executing an HD imagery. Moreover, the mosaic based gallery sections are engaging to capture your visitor’s attention. Best suited for visual artists and even for other creative niches; you can easily customize the elements to add a custom touch. You can also enable translation features, making it easier for your users to use the website. Similarly, the personalizing options are user-friendly so that you can add a custom background, menu styles and more effortlessly. Neve makes for a great multipurpose theme for any kind of freelancer or indie artist. Set up an online platform for your content to spread around the world using this highly customizable options. This WordPress artist theme comes with features built for portfolios, project listings and even supports WooCommerce. Neve’s excellent SEO optimized coding allows for a more responsive experience for your website viewer. Mobile optimization and Translation ready are also notable features included in this user-friendly theme. Moreover, it’s Gutenberg friendly design makes creating excellent content on your website an easy task. Similarly, Neve also lets you blog to your heart’s content with its blog optimized functions. SEO optimized and WooCommerce compatible. Mobile optimized and Lightweight design. Page builder friendly and easy to customize. Creating a band is tough as is, so is publishing your own music. 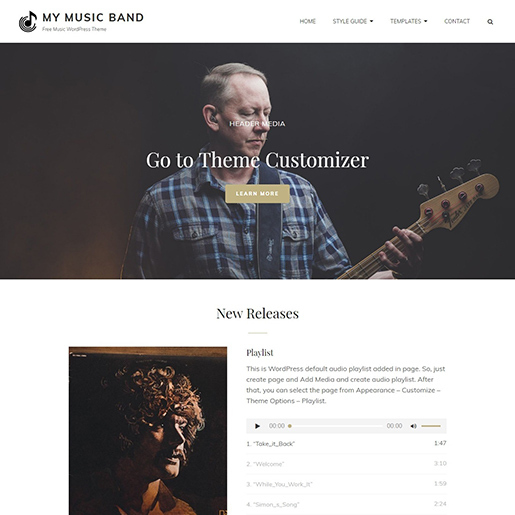 However, you can make the process of managing your online platform a bit easier using this excellent free WordPress theme for musicians. My Music Band focuses on helping you create an elegant profile for your bands, complete with access to all your music. Make your website accessible on all platforms using Rock band’s highly responsive coding and mobile-friendly layouts. You can also make use of essential features for the presentation of your band. Similarly, these features also include excellent featured images, sliders, music players and playlists, hero content, portfolios and more. The inclusion of News and blogging sections makes it easier to inform users about upcoming events, performances, and concerts. Excellent playlist with music embedding. Customizable menu with Featured image header. Hero content and Portfolio features. Mobile friendly with tons of customization options. Social media friendly and Blog friendly. Extend your creativity straight from your website and allow your online portfolios to represent yourself using this excellent WordPress themes. 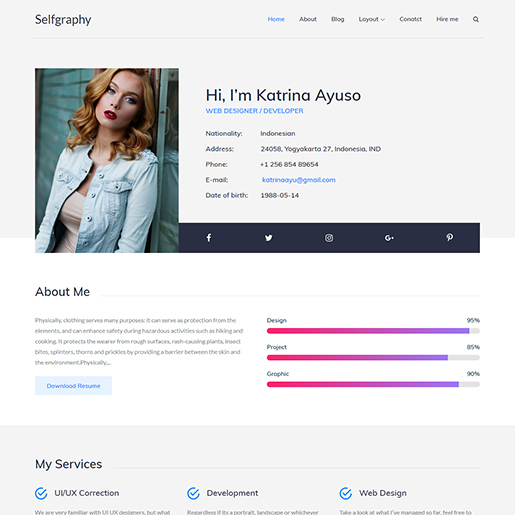 Selfgraphy definitely proves that it belongs on our list of WordPress themes for artists. Use its strong portfolio and project showcase features that do a great job of well representing the quality of your works. Moreover, it’s highly customizable Home page allows you to instantly set a good impression on your viewer’s mind regarding your arts and crafts. Make use of tons of custom widgets and custom page sections to make your life just a tad bit easier using Selfgraphy. Tons of typography options which are highly useful for blogging. Custom sections created for various purposes. Project listing and gallery centric design. Latte is a great parallax theme that combines the needs of WordPress artist themes with the aesthetics of a one-page layout. Moreover, Latte provides it all straight through the Theme Customizer. Similarly, it’s easy to use theme options also make for a great customization and appearance management panel. 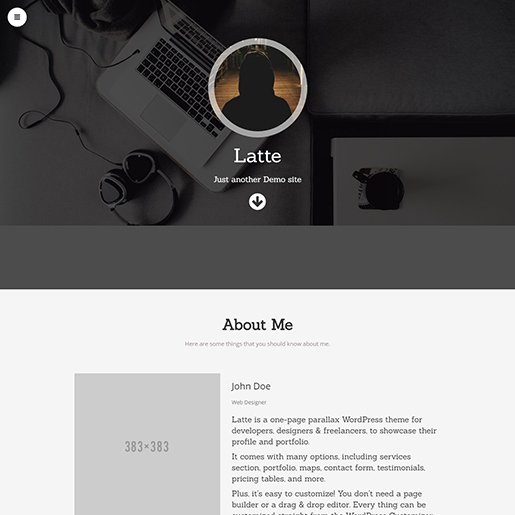 You can easily manage various elements of your website’s appearance using this Latte’s theme panel. Its unlimited color options and typography features make it quite flexible. In addition to this, Latte also comes with features for portfolios, galleries, custom contact forms, service sections, and more; all built specifically for independent artists. Responsive, One-page design that fits portfolios perfectly. Includes custom services, portfolio, maps and contact form sections. Unlimited colors and layout management for easy site management. The entire point of using specific WordPress artist themes is finding that perfect means of introducing yourself to the world. It’s important to define who you are and how creative you can be, straight from your website. HeyThere exists for that exact purpose and much more. This excellent project/portfolio theme makes use of tons of creative concepts to help your website stand out. Furthermore, the mix of vibrant colors, parallax and interactive elements and full-screen design makes using your website a charming experience. 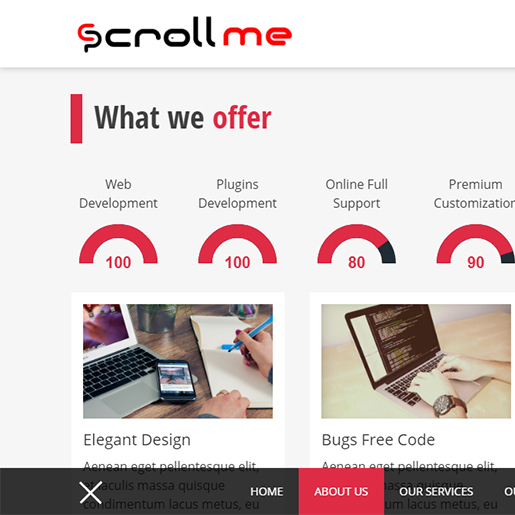 Moreover, its use of smooth scrolling effect and easy project listing also improves user experience on your website. Finally, its off-canvas menu is also a creative tool built for easy website navigation. Front page design specifically built for user interaction. Interactive layout with smooth scrolling. 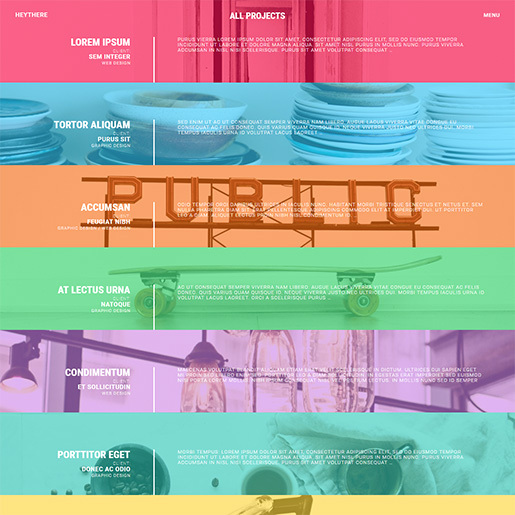 Elegant and Colorful Portfolio layout. Creative design built specifically for blogs. Hopefully, with this huge list of amazing WordPress themes for artists, we hope you found the perfect pick for you. Moreover, we’ve ensured that this list only contains the friendliest and feature enriched themes available. Additionally, the ranking on this list has no bearing on each individual theme’s quality. Do you have any suggestion for this list? Perhaps you’d like to share your experience with using various WordPress artist themes? Feel free to leave a comment telling us all you want to speak about WordPress themes and we’d be happy to talk to you about it. You can also ask questions regarding any of these themes and we’d be more than happy to help you out. Moreover, you can also leave a comment about what you think our blogs are missing so we can improve your reading experience even more in the future. 15 Amazingly Responsive Free WordPress Spa & Salon Themes 2019. 20 Best free WordPress themes for latest fashion trends. Love to read and socialize. This ThemeGrill author is free for all forms of criticism and advice. Yearning for new topics to learn and discuss. It’s Really Grateful to know about Huge list that contains Amazing Artists WordPress Plugins Collection. Highly Appreciated for this Blog.